Stephen's principal area of practice is corporate and business law for charities, insurance companies, business corporations, health care groups and professional practices. Stephen's practice also includes estate and tax planning and estate administration. Stephen provides advice and counsel to insurance companies, medical service corporations, non-share capital corporations and charities throughout Ontario. Stephen has made presentations to numerous groups on Board Governance and the responsibilities of directors of business corporations and charities. Stephen has also guest lectured at both local universities on various aspects of business law, franchises, and commercial financing, and to a number of local organizations on estate and tax planning and business succession. 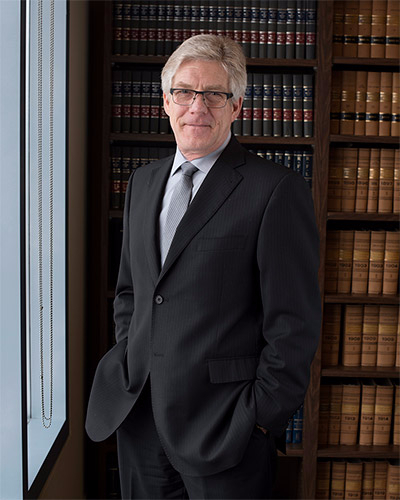 Stephen grew up in the Kitchener-Waterloo area, received his Bachelor of Arts degree, with Honours in Political Science, in 1978 from the University of Waterloo and his Bachelor of Laws degree from the University of Windsor in 1981. He was called to the Bar in 1983. Stephen was a long time member of the Board of Directors of the Grand River Conservation Authority. Stephen was actively involved in the Big Brothers Big Sisters Association in Kitchener -Waterloo, both as a Big Brother more than 20 years and as a member of the Board of Directors from 1990 through 2011, during which time he served three terms as President of the organization. Since 2001 Stephen has been Chair of Camp McGovern, a registered charity which operates a summer residential camp for "Little Brothers" and "Little Sisters", foster children and other children and youth served by United Way Agencies. Stephen is also on the Board of the Children's Safety Village of Waterloo Region, and is a Trustee of the Waterloo Law Association.